When working for royalty sometimes they can be messy especially when it comes to a princess. 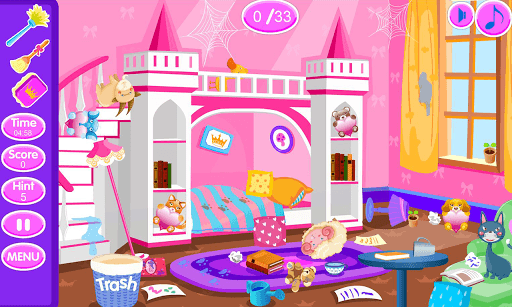 With this little princess cleanup game you can have fun cleaning up your princess’s room or your castle ready for her return. Here you can straighten the furniture, lights and wall hangings, clean the cobwebs, rearrange her dolls and other items, as well as throw the rubbish away, scrub the stains, sweep the floors and so much more! So if you want a challenge and test your cleaning skills, why not have a go with this princess room clean up game and see if you have what it takes to work for royalty. • Straighten the furniture, wall hanging and lights to make the room look straight. • Place the dolls and teddies back on the chair and in the bed. • Throw the rubbish away in the trash can so the floor is nice and clean. • Scrub the stains off the walls to make them look clean. 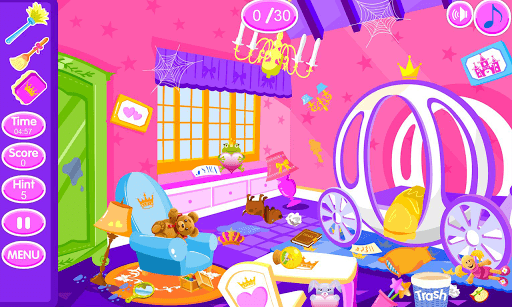 • Sweep the floor and dust the cobwebs from the ceiling to create a room fit for a princess.